Former President Jimmy Carter told a church congregation this weekend that he had spoken with President Donald Trump about China on Saturday, and suggested the commander in chief is worried that Beijing is outpacing its global rivals. According to Emma Hurt, a reporter for NPR affiliate WABE, Carter spoke of the call during his regular Sunday School lesson at his hometown Maranatha Baptist Church in Plains, Georgia. Carter said Trump was worried that “China is getting ahead of us,” and suggested the president was right to be concerned. Carter said he does not “really fear that time, but it bothers President Trump and I don’t know why. I’m not criticizing him—this morning,” he added, to laughs from fellow churchgoers. Carter—who normalized diplomatic relations between Washington and Beijing in 1979—suggested that China’s breakneck growth has been facilitated by sensible investment and buoyed by peace. In China, meanwhile, the economic benefits of peace are clear to see. “How many miles of high-speed railroad do we have in this country?” he asked. While China has some 18,000 miles of high-speed rail, the U.S. has “wasted I think $3 trillion” on military spending. “It’s more than you can imagine. China has not wasted a single penny on war and that’s why they’re ahead of us. In almost every way,” he added. The Trump administration remains locked in a costly trade war with China, though Treasury Secretary Steve Mnuchin said Saturday the end could be in sight. “I think we’re hopeful that we’re getting close to the final round of concluding issues,” Mnuchin told reporters according to The Wall Street Journal. 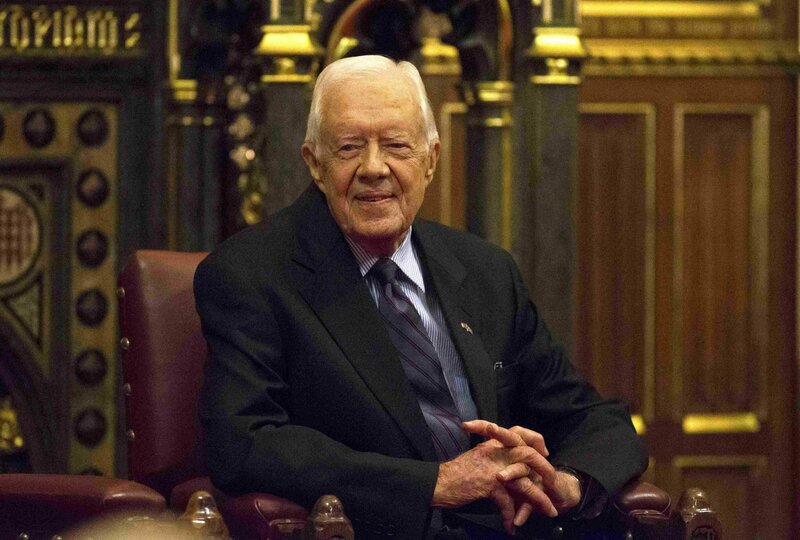 This file photo shows former U.S. President Jimmy Carter delivering a lecture at the House of Lords on February 3, 2016 in London, U.K.